After rereading this series in order to read the Tsubasa series by the same authors, which is loosely connected to it, I am more firmly convinced than ever that this is my all-time favorite manga series. It contains all the elements that I find appealing in my favorite books - complex characters who change and grow from story to story, fascinating fantasy elements, themes from folklore and mythology, and evocative, skillful illustrations. This volume continues the thread that began in Volume 7, in which Watanuki makes a sacrifice in order to help his friend Domeki, and in doing so he loses one of his eyes. (This loss of vision in one eye is a theme repeated in Tsubasa, with Syaoran's blindness in one eye - I wonder what 's going on with that?). Watanuki does not realize that his eye has become a sought-after prize in the spirit realm, and when he discovers that the Zashiki-Warashi, a lovely spirit-girl who has a crush on him, has been captured by a malicious being, he is astonished to learn that his eye is the cause of her troubles. The being that holds her captive is a dangerous force, and Watanuki rushes in to save the Zashiki-Warashi with no real idea what he's up against. There also remains the debt that exists between Watanuki and Domeki, and they need to find a way to settle that matter, as well. The following story in this same volume is a lighter, more humorous tale that recounts a shopping trip that Yuko, the space-time witch, takes, dragging Watanuki along as always, so he can carry everything back. He is dismayed to learn that they are shopping for a new refrigerator! He spies an unusual creature while they are in the store, and another strange adventure follows. Raiju: The name Raiju is made up of the kanji for "thunder" and "beast." In Japanese mythology, it usually appears in the form of living creatures such as cats or monkeys, but there are cases of it taking flight as a ball of lightning or fire. Raiju is the companion of Raiden, the Shinto god of lightning. Marks of lightning on a tree are said to be made by Raiju's claws. Joro-Gumo: Literally it means the Prostitute Spider. The Joro-Gumo as it exists today is an orb spider with the Latin name Nephila clavata. There are tales of a mystical Joro-Gumo from the Izu peninsula that depict her as the beautiful mistress of a waterfall who tries to ensnare a man in her webs and plunge him to his death. In another story, she takes fatal revenge for a broken promise. What a fun series this is, always full of interesting twists and turns, and problematic situations that are never resolved by taking the easy way out. I continue to enjoy the rich folkloric and mythological elements that help shape the stories, as well as the lovely artwork. Read about Comics: "In an ongoing serial comic, it’s easy for creators to take the easy route, keeping the status quo from one installment to the next and no real lasting effects shaking out. 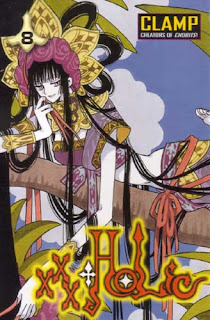 In some ways that’s part of what helps xxxHOLiC stand out so much for me; not only are the individual stories that make up the book interesting, but the book’s characters continue to grow and change in interesting ways." Once I finish Death Note this is the next manga seris I am going to start for sure. Manga with mythology, how could I not adore it?!? It's a great manga. I'm up to volume 13 @ the moment and a huge fan. does anyone else think there might be something going on between Domeki & Watanuki? And by something, I mean of the romantic variety. Rhinoa - I am really looking forward to hearing what you think of this one. It is so different from all the others I've read so far! Lady Disdain - I think you may have something there - it will be interesting so see how things play out. One thing I love about this manga is the complexity of the relationships. I'm glad you're enjoying this series, too. It's one of my absolute favorites!